London - Oscar Pistorius was not beaten because his opponent's blades were longer, a professor of sports engineering told Reuters on Monday. The South African, dubbed the "Blade Runner", was upset by Brazil's Alan Oliveira in the final of the Paralympic men's 200m and prompted controversy when he used a post-race interview to question the legitimacy of his defeat. Pistorius suggested that his opponent's prosthetics had artificially lengthened his stride, giving him an unfair advantage. According to Professor Steve Haake of Sheffield Hallam University, however, stride length and the size of his prosthetics were not the deciding factors in the result. "The practical outcome of larger blades is a greater stride length, assuming you turn over your legs at the same rate," Haake told Reuters in a telephone interview. "But to do that, the mass of the legs needs to be smaller. It is called the conservation of angular momentum. "Imagine the experiment when you spin someone round on an office chair with their arms outstretched. If they bring their arms in, they speed up. It is the same effect with athletes' prosthetics. When the mass is closer to the centre they are easier to spin. "Just making the legs longer, therefore, doesn't necessarily make Oliveira quicker... In any case, if you look at Oliveira, he actually took more strides, which means a shorter stride length. It was that that won him the race." 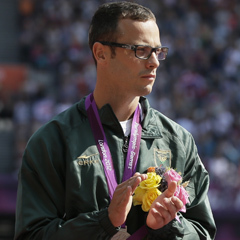 Haake also questioned whether Pistorius, who runs against able-bodied athletes and competed in last month's Olympics, had damaged his argument that his prosthetics do not give him an advantage. "I think he was saying the rules are wrong, that having the scope to lengthen the legs is not fair," Haake said. "In doing this he has opened a can of worms. If he is saying, 'If you lengthen your legs you are at an advantage', then he blows his argument out of the water that he gains no advantage over able-bodied athletes by using prosthetics. "He is in a difficult place and can't have it both ways." Professor Andy Miah, of the University of the West of Scotland, is another who questions whether Pistorius is treading on awkward philosophical ground. "It would be a mistake to say that Oscar has been beaten at his own game, but critics have drawn parallels to his concern about Oliveira with arguments against Oscar's participation within the Olympic Games," he said on his personal website (www.andymiah.net). "The big question emerging from the race last night is whether the Paralympic rules within the T43 200m race need to be tighter. "It's normal that a past winner should face young challengers and that they should eventually dethrone the champion. However, this looks like an unusual win and the concerns have been raised by other Paralympians about athletes adjusting their blade dimensions. "If Oliveira's prosthetic legs are bigger and better and legal, then Pistorius really ought to get some. If his body height precludes this and the only reason why Oliveira has longer blades is that he is taller, then Pistorius has been beaten by a more biologically privileged athlete."